After 11hrs, 3 bus changes, 2 police searches and 1 iffy border crossing, we arrived in Nicaragua. As we were driving through Managua towards Granada, I could see some multi-story buildings, chain stores and the almighty McDonalds. After the poverty of Honduras, I was relieved that Nicaragua was looking modern and americanised. I know that probably sounds awful to a lot of people, but I don't care, I was so sick and tired of seeing nothing but poor people; it was depressing and getting me down. I was glad to have a little bit of normality and modern convenience again. I met Toby and Sophie on the bus, they were both from London and they seemed really nice. Toby actually helped me break up a fight between two street kids, who were fighting over my suitcase at the border stop. They were hoping I would pay them to pull my suitcase the 10 meters across the border, but after watching them attack each other so viciously, I decided to give them both a wide berth. When we arrived the 3 of us decided to go to the Oasis hostel together, which turned out to be a great idea. This hostel was big and spacious, extremely clean (which was a treat) with big, comfy beds, hammocks everywhere and a really nice pool. 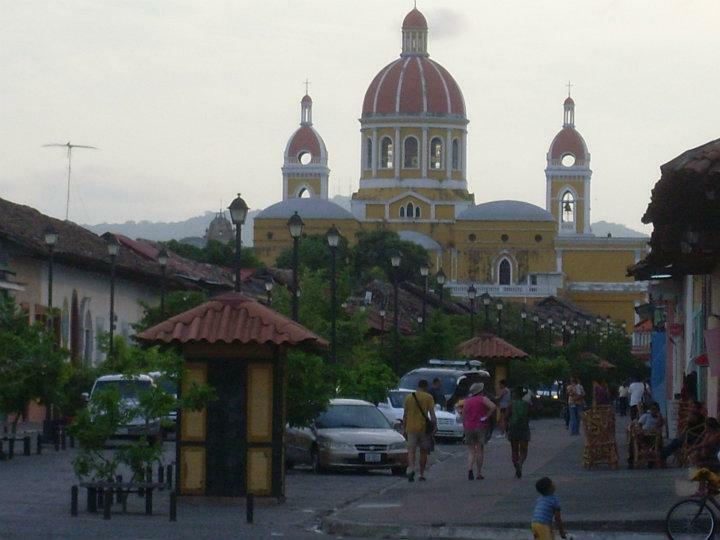 Granada is a colonial city with a modern flair. It has some beautiful old buildings, international cuisine, a surprisingly thriving tourism industry, but it also has its share of street kids, disgusting smells and local weirdos. To me Granada is the poor man's Antigua (Guatemala), all the colonial style, but with less sophistication or wealth and a seedy underside. I liked it immediately, so much so that I ended up going back there for an extra few days before I left Nicaragua. The day we arrived we didn't get up to very much; we just walked around the city and got our bearings. Then splurged at the Imagine Bar and had a really nice steak dinner and a few drinks (it was almost my birthday, so I totally deserved it!). The next day we met Melanie, a weed grower from San Francisco. No joke, she grows medical marijuana at her home and then sells it to clinics. She joined us for a wander around town and then breakfast. Toby & Sophie surprised me with a birthday breakfast at the Euro café, which including an embarrassing rendition of "Happy Birthday" from all the staff and a banana nut muffin with matches in place of candles. Considering we knew each other a total of 2 days, it was super nice of them and it totally made my day. The three of them were actually heading off to Leon later that day, so we said our goodbyes that afternoon and I was left all by my lonesome….but not for long. I spent the rest of the day sightseeing and wandering around town checking out a variety of churches, cathedrals, colonial buildings, museums etc. As I was walking back towards my hostel something caught my attention out the corner of my eye. I turned to look and saw a man running across the street at me and shouting. I was trying to decide what to do, when I realised it was Martin and he was shouting "Your Alive, your Alive!" I couldn't believe it because I had last seen Martin in Tegucigalpa, Honduras, right before I was abducted by a taxi driver. Ava caught up to us as well and they told me how as soon as I had left, they said to each other "we shouldn't have left her on her own with" meaning the taxi driver and then when they got to the hostel and realised I wasn't there, they thought the driver had killed me. So, they were very glad to see that I was still alive! I explained to them what had happened and after the initial shock had worm off, we had a good laugh about it. What else can you do? I ended up having dinner with Ava and Martin and afterwards we said our goodbyes and I headed back to my hostel. When I got back I ended up meeting this guy who was also staying at the Oasis. His name was Justin Jones (not his real name, long story) and we got on really well. He was an interesting guy, a total hippy from California. Not the "in desperate need of a wash, got no money or job type of hippy", but more of an educated travel writer slash professional backpacker type, chasing the elusive Zen lifestyle type of hippy! We were sitting around the hostel having a chat and a few drinks when we met Becca & Daniel (New Zealand & Holland) and later we were also joined by Tessa (Holland). Justin took it upon himself to make sure I had a fantastic birthday night out and convinced us all to hit the town and see what Granada's nightlife had to offer. We started at O'Shea's Bar (of course there was an Irish bar) and we were like magnets for every street kid in the area. Most of them didn't hang around long once they realised we weren't going to give them any money. However, this one kid who was about 10 going on 30, stuck around and was chatting with us for a while. His mother was hanging around as well; she was cracked out her nut and busy harassing these two poor German men. I think she was trying to get them to give her cigarettes, but they looked very uncomfortable and she would not leave them alone. It was quite sad actually, so we bought the kid a coke and he entertained us with his chat for a good wee while. He was a total, little con artist and told us the most insane stories, which no doubt were all a total pack of lies, but highly entertaining. We ended up staying at O'Shea's until closing and then we headed off in search of a club. It turns out most places close early in Granada, so there wasn't much opened after midnight. We ended up in this tacky karaoke bar that was filled with locals who could not sing, but clearly thought they could and they had no shame in belting out one bad rendition after another. For some reason they all chose the most difficult songs to sing as well. The whole night they slaughtered a variety of Whitney Houston, Mariah Carey, and Celine Dion etc. It was painful, but also hilarious because they couldn't pronounce the words properly and every single one of them was tone deaf. It turned out to be a great night and we all had such a laugh. I was glad I got to spend my birthday with such a nice group of people. The next morning I was off on a day trip (hangover and all) to Laguna de Apoyo (Crater Lake). On the ride over I met Adi & Chris from Ireland and we ended up spending most of the day together. This lake was just amazing; it was a giant crater in the middle of the hillside. It was a fresh water lake and it was so warm and pristine, you could see the bottom no matter how deep the water. The whole day was spent swimming, kayaking, sunbathing and just relaxing. Three hours in and the heavens just opened and there was a torrential downpour. I've never seen rain hit that hard or fast before. It just came out of nowhere, but it didn't stop the fun, everyone just ran into the water and swam over to the pontoons. It ended just as fast as it started and the sun was back out before long. After our day trip we all headed back to the hostel and decided to have a quite night. A few of us went to this Chinese restaurant for dinner and on arrival we realised the whole place was filled with trannies. It was an interesting dinner, really good food and the whole time we got to listened to the Bee-Gee's greatest hits on the stereo. After dinner we all headed back for a few drinks in the hostel. Justin joined us as well and it ended up being a not so quiet, little night after all. The next day I was up and on the road bright and early headed for Leon (see Leon Blog). After a quick trip to Leon I headed back to Granada and spent another 3 nights there just seeing the sights and taking it easy. The only problem with Granada was the men, they do this thing were they hiss at you. It happened all the time and they would actually pull up beside you in their cars or follow you down the street just to hiss at you. I swear you would think they had never seen a woman before, it got annoying really fast. I guess it's their version or wolf whistling and the local women seem to like it for some demented reason, but all the travellers I met found it really horrible and rightly so. While I was there I spent a day wandering around the local market. I say wandering, but it was more like being pulled and pushed from one stall to the other. The locals were constantly trying to drag you into their stall or store to get you to buy stuff and they were always shouting at me in Spanish (most of which I couldn't understand). It was a bit intimidating at first, but after a while you just got us to it and ignored them. The market was insane. It was a giant maze of disgusting smells and sights, especially the fish and meat stalls. The packs of wild dogs that roamed the market were also a bit off putting and scary. All in all, it was definitely a new experience for me! I don't know why I liked Granada so much…I just had a really fun time there and met some great people.